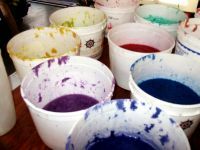 Seastone Papers offers open studio time scheduled for artist projects. During the summer months, open studio will be held each Friday. Prior consultation of the artist's project is important to ensure preparation of the appropriate pulp and studio space. The fee includes cotton/abaca pulp—up to two 5 gallon buckets, use of studio equipment, full time assistance throughout, and drying of completed work. Additional or specially prepared pulp and pigments will incur added fees. 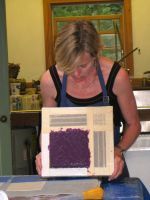 Papermaking experience is a requisite. Private instruction is available at an additional rate. Work Hours/Time: Up to six hours per day with 1/2 hour included for clean-up.